For other uses, see Seed (disambiguation). A seed is an embryonic plant enclosed in a protective outer covering . The formation of the seed is part of the process of reproduction in seed plants, the spermatophytes, including the gymnosperm and angiosperm plants. The term "seed" also has a general meaning that antedates the above – anything that can be sown, e.g. "seed" potatoes, "seeds" of corn or sunflower "seeds". In the case of sunflower and corn "seeds", what is sown is the seed enclosed in a shell or husk, whereas the potato is a tuber. Many structures commonly referred to as "seeds" are actually dry fruits. Plants producing berries are called baccate. Sunflower seeds are sometimes sold commercially while still enclosed within the hard wall of the fruit, which must be split open to reach the seed. Different groups of plants have other modifications, the so-called stone fruits (such as the peach) have a hardened fruit layer (the endocarp) fused to and surrounding the actual seed. Nuts are the one-seeded, hard-shelled fruit of some plants with an indehiscent seed, such as an acorn or hazelnut. Seeds are produced in several related groups of plants, and their manner of production distinguishes the angiosperms ("enclosed seeds") from the gymnosperms ("naked seeds"). Angiosperm seeds are produced in a hard or fleshy structure called a fruit that encloses the seeds for protection in order to secure healthy growth. Some fruits have layers of both hard and fleshy material. In gymnosperms, no special structure develops to enclose the seeds, which begin their development "naked" on the bracts of cones. However, the seeds do become covered by the cone scales as they develop in some species of conifer. Seed production in natural plant populations varies widely from year to year in response to weather variables, insects and diseases, and internal cycles within the plants themselves. Over a 20-year period, for example, forests composed of loblolly pine and shortleaf pine produced from 0 to nearly 5 million sound pine seeds per hectare. Over this period, there were six bumper, five poor, and nine good seed crops, when evaluated for production of adequate seedlings for natural forest reproduction. Angiosperm (flowering plants) seeds consist of three genetically distinct constituents: (1) the embryo formed from the zygote, (2) the endosperm, which is normally triploid, (3) the seed coat from tissue derived from the maternal tissue of the ovule. In angiosperms, the process of seed development begins with double fertilization, which involves the fusion of two male gametes with the egg cell and the central cell to form the primary endosperm and the zygote. Right after fertilization, the zygote is mostly inactive, but the primary endosperm divides rapidly to form the endosperm tissue. This tissue becomes the food the young plant will consume until the roots have developed after germination. The chalaza, the base of the ovule opposite the micropyle, where integument and nucellus are joined together. In the majority of flowering plants, the zygote's first division is transversely oriented in regards to the long axis, and this establishes the polarity of the embryo. The upper or chalazal pole becomes the main area of growth of the embryo, while the lower or micropylar pole produces the stalk-like suspensor that attaches to the micropyle. The suspensor absorbs and manufactures nutrients from the endosperm that are used during the embryo's growth. The hypocotyl, the embryonic axis below the point of attachment of the cotyledon(s), connecting the epicotyl and the radicle, being the stem-root transition zone. Monocotyledonous plants have two additional structures in the form of sheaths. The plumule is covered with a coleoptile that forms the first leaf while the radicle is covered with a coleorhiza that connects to the primary root and adventitious roots form from the sides. Here the hypocotyl is a rudimentary axis between radicle and plumule. The seeds of corn are constructed with these structures; pericarp, scutellum (single large cotyledon) that absorbs nutrients from the endosperm, plumule, radicle, coleoptile and coleorhiza – these last two structures are sheath-like and enclose the plumule and radicle, acting as a protective covering. In gymnosperms, which do not form ovaries, the ovules and hence the seeds are exposed. This is the basis for their nomenclature – naked seeded plants. Two sperm cells transferred from the pollen do not develop the seed by double fertilization, but one sperm nucleus unites with the egg nucleus and the other sperm is not used. Sometimes each sperm fertilizes an egg cell and one zygote is then aborted or absorbed during early development. The seed is composed of the embryo (the result of fertilization) and tissue from the mother plant, which also form a cone around the seed in coniferous plants such as pine and spruce. Within the seed, there usually is a store of nutrients for the seedling that will grow from the embryo. The form of the stored nutrition varies depending on the kind of plant. In angiosperms, the stored food begins as a tissue called the endosperm, which is derived from the mother plant and the pollen via double fertilization. It is usually triploid, and is rich in oil or starch, and protein. In gymnosperms, such as conifers, the food storage tissue (also called endosperm) is part of the female gametophyte, a haploid tissue. The endosperm is surrounded by the aleurone layer (peripheral endosperm), filled with proteinaceous aleurone grains. Originally, by analogy with the animal ovum, the outer nucellus layer (perisperm) was referred to as albumen, and the inner endosperm layer as vitellus. Although misleading, the term began to be applied to all the nutrient matter. This terminology persists in referring to endospermic seeds as "albuminous". The nature of this material is used in both describing and classifying seeds, in addition to the embryo to endosperm size ratio. The endosperm may be considered to be farinaceous (or mealy) in which the cells are filled with starch, as for instance cereal grains, or not (non-farinaceous). The endosperm may also be referred to as "fleshy" or "cartilaginous" with thicker soft cells such as coconut, but may also be oily as in Ricinus (castor oil), Croton and Poppy. The endosperm is called "horny" when the cell walls are thicker such as date and coffee, or "ruminated" if mottled, as in nutmeg, palms and Annonaceae. In most monocotyledons (such as grasses and palms) and some (endospermic or albuminous) dicotyledons (such as castor beans) the embryo is embedded in the endosperm (and nucellus), which the seedling will use upon germination. In the non-endospermic dicotyledons the endosperm is absorbed by the embryo as the latter grows within the developing seed, and the cotyledons of the embryo become filled with stored food. At maturity, seeds of these species have no endosperm and are also referred to as exalbuminous seeds. The exalbuminous seeds include the legumes (such as beans and peas), trees such as the oak and walnut, vegetables such as squash and radish, and sunflowers. According to Bewley and Black (1978), Brazil nut storage is in hypocotyl, this place of storage is uncommon among seeds. All gymnosperm seeds are albuminous. The seed coat develops from the maternal tissue, the integuments, originally surrounding the ovule. The seed coat in the mature seed can be a paper-thin layer (e.g. peanut) or something more substantial (e.g. thick and hard in honey locust and coconut), or fleshy as in the sarcotesta of pomegranate. The seed coat helps protect the embryo from mechanical injury, predators and drying out. Depending on its development, the seed coat is either bitegmic or unitegmic. Bitegmic seeds form a testa from the outer integument and a tegmen from the inner integument while unitegmic seeds have only one integument. Usually parts of the testa or tegmen form a hard protective mechanical layer. The mechanical layer may prevent water penetration and germination. Amongst the barriers may be the presence of lignified sclereids. Seeds are very diverse in size. The dust-like orchid seeds are the smallest, with about one million seeds per gram; they are often embryonic seeds with immature embryos and no significant energy reserves. Orchids and a few other groups of plants are mycoheterotrophs which depend on mycorrhizal fungi for nutrition during germination and the early growth of the seedling. Some terrestrial orchid seedlings, in fact, spend the first few years of their lives deriving energy from the fungi and do not produce green leaves. At over 20 kg, the largest seed is the coco de mer. Plants that produce smaller seeds can generate many more seeds per flower, while plants with larger seeds invest more resources into those seeds and normally produce fewer seeds. Small seeds are quicker to ripen and can be dispersed sooner, so fall blooming plants often have small seeds. Many annual plants produce great quantities of smaller seeds; this helps to ensure at least a few will end in a favorable place for growth. Herbaceous perennials and woody plants often have larger seeds; they can produce seeds over many years, and larger seeds have more energy reserves for germination and seedling growth and produce larger, more established seedlings after germination. Seeds serve several functions for the plants that produce them. Key among these functions are nourishment of the embryo, dispersal to a new location, and dormancy during unfavorable conditions. Seeds fundamentally are means of reproduction, and most seeds are the product of sexual reproduction which produces a remixing of genetic material and phenotype variability on which natural selection acts. Unlike animals, plants are limited in their ability to seek out favorable conditions for life and growth. As a result, plants have evolved many ways to disperse their offspring by dispersing their seeds (see also vegetative reproduction). A seed must somehow "arrive" at a location and be there at a time favorable for germination and growth. When the fruits open and release their seeds in a regular way, it is called dehiscent, which is often distinctive for related groups of plants; these fruits include capsules, follicles, legumes, silicles and siliques. When fruits do not open and release their seeds in a regular fashion, they are called indehiscent, which include the fruits achenes, caryopsis, nuts, samaras, and utricles. Myrmecochory is the dispersal of seeds by ants. Foraging ants disperse seeds which have appendages called elaiosomes (e.g. bloodroot, trilliums, acacias, and many species of Proteaceae). Elaiosomes are soft, fleshy structures that contain nutrients for animals that eat them. The ants carry such seeds back to their nest, where the elaiosomes are eaten. The remainder of the seed, which is hard and inedible to the ants, then germinates either within the nest or at a removal site where the seed has been discarded by the ants. This dispersal relationship is an example of mutualism, since the plants depend upon the ants to disperse seeds, while the ants depend upon the plants seeds for food. As a result, a drop in numbers of one partner can reduce success of the other. In South Africa, the Argentine ant (Linepithema humile) has invaded and displaced native species of ants. Unlike the native ant species, Argentine ants do not collect the seeds of Mimetes cucullatus or eat the elaiosomes. In areas where these ants have invaded, the numbers of Mimetes seedlings have dropped. Seed dormancy has two main functions: the first is synchronizing germination with the optimal conditions for survival of the resulting seedling; the second is spreading germination of a batch of seeds over time so a catastrophe (e.g. late frosts, drought, herbivory) does not result in the death of all offspring of a plant (bet-hedging). Seed dormancy is defined as a seed failing to germinate under environmental conditions optimal for germination, normally when the environment is at a suitable temperature with proper soil moisture. This true dormancy or innate dormancy is therefore caused by conditions within the seed that prevent germination. Thus dormancy is a state of the seed, not of the environment. Induced dormancy, enforced dormancy or seed quiescence occurs when a seed fails to germinate because the external environmental conditions are inappropriate for germination, mostly in response to conditions being too dark or light, too cold or hot, or too dry. Often, seed dormancy is divided into four major categories: exogenous; endogenous; combinational; and secondary. A more recent system distinguishes five classes: morphological, physiological, morphophysiological, physical, and combinational dormancy. Morphophysiological dormancy includes seeds with underdeveloped embryos, and also have physiological components to dormancy. These seeds, therefore, require a dormancy-breaking treatments, as well as a period of time to develop fully grown embryos. Plant families where morphophysiological dormancy occurs include Apiaceae, Aquifoliaceae, Liliaceae, Magnoliaceae, Papaveraceae and Ranunculaceae. Some plants with morphophysiological dormancy, such as Asarum or Trillium species, have multiple types of dormancy, one affects radicle (root) growth, while the other affects plumule (shoot) growth. The terms "double dormancy" and "two-year seeds" are used for species whose seeds need two years to complete germination or at least two winters and one summer. Dormancy of the radicle (seedling root) is broken during the first winter after dispersal while dormancy of the shoot bud is broken during the second winter. Physiological dormancy means the embryo, due to physiological causes, cannot generate enough power to break through the seed coat, endosperm or other covering structures. Dormancy is typically broken at cool wet, warm wet or warm dry conditions. Abscisic acid is usually the growth inhibitor in seeds, and its production can be affected by light. During seed dormancy, often associated with unpredictable and stressful environments, DNA damage accumulates as the seeds age. In rye seeds, the reduction of DNA integrity due to damage is associated with loss of seed viability during storage. Upon germination, seeds of Vicia faba undergo DNA repair. A plant DNA ligase that is involved in repair of single- and double-strand breaks during seed germination is an important determinant of seed longevity. Also, in Arabidopsis seeds, the activities of the DNA repair enzymes Poly ADP ribose polymerases (PARP) are likely needed for successful germination. Thus DNA damages that accumulate during dormancy appear to be a problem for seed survival, and the enzymatic repair of DNA damages during germination appears to be important for seed viability. A number of different strategies are used by gardeners and horticulturists to break seed dormancy. Leaching or the soaking in water removes chemical inhibitors in some seeds that prevent germination. Rain and melting snow naturally accomplish this task. For seeds planted in gardens, running water is best – if soaked in a container, 12 to 24 hours of soaking is sufficient. Soaking longer, especially in stagnant water, can result in oxygen starvation and seed death. Seeds with hard seed coats can be soaked in hot water to break open the impermeable cell layers that prevent water intake. The first "true" seeds are described from the upper Devonian, which is probably the theater of their true first evolutionary radiation. With this radiation came an evolution of seed size, shape, dispersal and eventually the radiation of gymnosperms and angiosperms and monocotyledons and dicotyledons. The seed plants progressively became one of the major elements of nearly all ecosystems. Phaseolus vulgaris (common bean or green bean) seeds are diverse in size, shape, and color. In the United States farmers spent $22 billion on seeds in 2018, a 35 percent increase since 2010. DowDuPont and Monsanto account for 72 percent of corn and soybean seed sales in the U.S. with the average price of a bag of GMO corn seed is priced at $270. Many seeds are edible and the majority of human calories comes from seeds, especially from cereals, legumes and nuts. Seeds also provide most cooking oils, many beverages and spices and some important food additives. In different seeds the seed embryo or the endosperm dominates and provides most of the nutrients. The storage proteins of the embryo and endosperm differ in their amino acid content and physical properties. For example, the gluten of wheat, important in providing the elastic property to bread dough is strictly an endosperm protein. Seeds are used to propagate many crops such as cereals, legumes, forest trees, turfgrasses, and pasture grasses. Particularly in developing countries, a major constraint faced is the inadequacy of the marketing channels to get the seed to poor farmers. Thus the use of farmer-retained seed remains quite common. Seeds are also eaten by animals (seed predation), and are also fed to livestock or provided as birdseed. While some seeds are edible, others are harmful, poisonous or deadly. Plants and seeds often contain chemical compounds to discourage herbivores and seed predators. In some cases, these compounds simply taste bad (such as in mustard), but other compounds are toxic or break down into toxic compounds within the digestive system. Children, being smaller than adults, are more susceptible to poisoning by plants and seeds. A deadly poison, ricin, comes from seeds of the castor bean. Reported lethal doses are anywhere from two to eight seeds, though only a few deaths have been reported when castor beans have been ingested by animals. In addition, seeds containing amygdalin – apple, apricot, bitter almond, peach, plum, cherry, quince, and others – when consumed in sufficient amounts, may cause cyanide poisoning. Other seeds that contain poisons include annona, cotton, custard apple, datura, uncooked durian, golden chain, horse-chestnut, larkspur, locoweed, lychee, nectarine, rambutan, rosary pea, sour sop, sugar apple, wisteria, and yew. The seeds of the strychnine tree are also poisonous, containing the poison strychnine. The seeds of many legumes, including the common bean (Phaseolus vulgaris), contain proteins called lectins which can cause gastric distress if the beans are eaten without cooking. The common bean and many others, including the soybean, also contain trypsin inhibitors which interfere with the action of the digestive enzyme trypsin. Normal cooking processes degrade lectins and trypsin inhibitors to harmless forms. Please see the category plant toxins for further relevant articles. Cotton fiber grows attached to cotton plant seeds. Other seed fibers are from kapok and milkweed. Many important nonfood oils are extracted from seeds. Linseed oil is used in paints. Oil from jojoba and crambe are similar to whale oil. Seeds are the source of some medicines including castor oil, tea tree oil and the quack cancer drug Laetrile. Many seeds have been used as beads in necklaces and rosaries including Job's tears, Chinaberry, rosary pea, and castor bean. However, the latter three are also poisonous. Cottonseed meal used as animal feed and fertilizer. The largest seed is produced by the coco de mer, or "double coconut palm", Lodoicea maldivica. The entire fruit may weigh up to 23 kilograms (50 pounds) and usually contains a single seed. The earliest fossil seeds are around 365 million years old from the Late Devonian of West Virginia. The seeds are preserved immature ovules of the plant Elkinsia polymorpha. ^ Cain M.D., Shelton M.G. (2001). "Twenty years of natural loblolly and shortleaf pine seed production on the Crossett Experimental Forest in southeastern Arkansas". Southern Journal of Applied Forestry. 25 (1): 40–45. ^ Galili G; Kigel J (1995). "Chapter One". Seed development and germination. New York: M. Dekker. ISBN 978-0-8247-9229-9. ^ Raven, Peter H., Ray Franklin Evert, and Helena Curtis. 1981. Biology of plants. New York: Worth Publishers. p. 410. ^ Rost, Thomas L.; Weier, T. Elliot; Weier, Thomas Elliot (1979). Botany: a brief introduction to plant biology. New York: Wiley. p. 319. ISBN 978-0-471-02114-8. ^ Filonova LH; Bozhkov PV; von Arnold S (February 2000). "Developmental pathway of somatic embryogenesis in Picea abies as revealed by time-lapse tracking". J Exp Bot. 51 (343): 249–264. doi:10.1093/jexbot/51.343.249. PMID 10938831. Archived from the original on 2008-12-07. ^ "Seed shape". anbg.gov.au. Archived from the original on 2014-02-26. ^ Baskin, Carol C.; Baskin, Jerry M. (2001). Carol C. Baskin, Jerry M. Baskin. Seeds: Ecology, Biogeography, and Evolution of Dormancy and Germination. Elsevier, 2001. google.ca. p. 27. ISBN 978-0-12-080263-0. ^ "The Encyclopædia Britannica, 9th ed. (1888) vol. 4". google.ca. 1888. p. 155. ^ "Sinauer Associates, Inc., Publishers". 5e.plantphys.net. Archived from the original on 22 January 2014. Retrieved 7 May 2018. ^ "plant_anatomy Term "seed coat epidermis" (PO:0006048)". gramene.org. Archived from the original on 2014-02-03. ^ Rudall, Paula J. (2007). 6 – Seed and fruit – University Publishing Online – Paula J. Rudall. Anatomy of Flowering Plants: An Introduction to Structure and Development. Third edition. Cambridge University Press. doi:10.1017/CBO9780511801709. ISBN 978-0-521-69245-8. ^ Smith, Welby R. 1993. Orchids of Minnesota. Minneapolis: University of Minnesota Press. p. 8. ^ Kosinki, Igor (2007). "Long-term variability in seed size and seedling establishment of Maianthemum bifolium". Plant Ecology. 194 (2): 149–156. doi:10.1007/s11258-007-9281-1. ^ Shannon DA; Isaac L; Brockman FE (February 1996). "Assessment of hedgerow species for seed size, stand establishment and seedling height". Agroforestry Systems. 35 (1): 95–110. doi:10.1007/BF02345331. ^ Jones, Samuel B., and Arlene E. Luchsinger. 1979. Plant systematics. McGraw-Hill series in organismic biology. New York: McGraw-Hill. p. 195. ^ Morhardt, Sia; Morhardt, Emil; Emil Morhardt, J. (2004). California desert flowers: an introduction to families, genera, and species. Berkeley: University of California Press. p. 24. ISBN 978-0-520-24003-2. 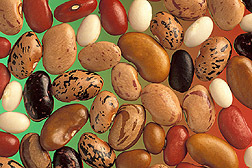 ^ "www.seabean.com – Sea-Beans and Drift Seeds". seabean.com. Archived from the original on 2006-07-11. ^ Marinelli J (1999). "Ants – The astonishing intimacy between ants & plants". Plants & Gardens News. 14 (1). Archived from the original on 2006-08-18. ^ Ricklefs, Robert E. (1993) The Economy of Nature, 3rd ed., p. 396. (New York: W.H. Freeman). ISBN 0-7167-2409-X. ^ Bond, W.J. ; P. Slingsby (1984). "Collapse of an ant-plant mutualism: The Argentine ant, Iridomyrmex humilis and myrmecochorous Proteaceae". Ecology. 65 (4): 1031–1037. doi:10.2307/1938311. JSTOR 1938311. ^ Baskin J.M., Baskin C.C. (2004). "A classification system for seed dormancy". Seed Science Research. 14: 1–16. doi:10.1079/ssr2003150. ^ International Workshop on Seeds, and G. Nicolas. 2003. The biology of seeds recent research advances : proceedings of the Seventh International Workshop on Seeds, Salamanca, Spain 2002. Wallingford, Oxon, UK: CABI Pub. p. 113. ^ Bewley, J. Derek, and Michael Black. 1994. Seeds physiology of development and germination. The language of science. New York: Plenum Press. p. 230. ^ Patten D.T. (1978). "Productivity and production efficiency of an Upper Sonoran Desert ephemeral community". American Journal of Botany. 65 (8): 891–895. doi:10.2307/2442185. JSTOR 2442185. ^ Black, Michael H.; Halmer, Peter (2006). The encyclopedia of seeds: science, technology and uses. Wallingford, UK: CABI. p. 224. ISBN 978-0-85199-723-0. ^ International Seed Testing Association. 1973. ISSN 0251-0952. pp. 120–121.Seed science and technology. Wageningen? : International Seed Testing Association. ^ a b Cheah KS; Osborne DJ (April 1978). "DNA lesions occur with loss of viability in embryos of ageing rye seed". Nature. 272 (5654): 593–599. doi:10.1038/272593a0. PMID 19213149. ^ a b Koppen G; Verschaeve L (2001). "The alkaline single-cell gel electrophoresis/comet assay: a way to study DNA repair in radicle cells of germinating Vicia faba". Folia Biol. (Praha). 47 (2): 50–54. PMID 11321247. ^ Bray CM; West CE (December 2005). "DNA repair mechanisms in plants: crucial sensors and effectors for the maintenance of genome integrity". New Phytol. 168 (3): 511–528. doi:10.1111/j.1469-8137.2005.01548.x. PMID 16313635. ^ Waterworth WM; Masnavi G; Bhardwaj RM; Jiang Q; Bray CM; West CE (September 2010). "A plant DNA ligase is an important determinant of seed longevity". Plant J. 63 (5): 848–860. doi:10.1111/j.1365-313X.2010.04285.x. PMID 20584150. ^ Hunt L; Holdsworth MJ; Gray JE (August 2007). "Nicotinamidase activity is important for germination". Plant J. 51 (3): 341–351. doi:10.1111/j.1365-313X.2007.03151.x. PMID 17587307. ^ Hartmann, Hudson Thomas, and Dale E. Kester. 1983. Plant propagation principles and practices. Englewood Cliffs, NJ: Prentice-Hall. ISBN 0-13-681007-1. pp. 175–177. ^ Jon E. Keeley and Fotheringham (1997-05-23). "Trace Gas Emissions and Smoke-Induced Seed Germination". Science. 276 (276 (5316)): 1248–1250. CiteSeerX 10.1.1.3.2708. doi:10.1126/science.276.5316.1248. ^ Dunn, Elizabeth G. (2019-03-04). "The Startup Taking On Bayer With Cheaper, Non-GMO Seeds". Bloomberg Businessweek. Retrieved 2019-03-07. ^ Sabelli, P.A. ; Larkins, B.A. (2009). "The Development of Endosperm in Grasses". Plant Physiology. 149 (1): 14–26. doi:10.1104/pp.108.129437. PMC 2613697. PMID 19126691. ^ Chia Joo Suan, "Seeds of Doubt: Food Safety Archived 2008-04-29 at the Wayback Machine"
^ a b Martin Anderson, Texas AgriLife Extension Service. "Poisonous Plants and Plant Parts – Archives – Aggie Horticulture". tamu.edu. Archived from the original on 2007-09-08. ^ Wedin GP; Neal JS; Everson GW; Krenzelok EP (May 1986). "Castor bean poisoning". Am J Emerg Med. 4 (3): 259–261. doi:10.1016/0735-6757(86)90080-X. PMID 3964368. ^ Albretsen JC; Gwaltney-Brant SM; Khan SA (2000). "Evaluation of castor bean toxicosis in dogs: 98 cases". J Am Anim Hosp Assoc. 36 (3): 229–233. doi:10.5326/15473317-36-3-229. PMID 10825094. Archived from the original on 2012-08-02. ^ a b "Almond/Almond Oil". drugs.com. Archived from the original on 2017-07-18. ^ Dhurandhar NV; Chang KC (1990). "Effect of Cooking on Firmness, Trypsin Inhibitors, Lectins and Cystine/Cysteine content of Navy and Red Kidney Beans (Phaseolus vulgaris)". J Food Sci. 55 (2): 470–474. doi:10.1111/j.1365-2621.1990.tb06789.x. Archived from the original on 2013-01-05. ^ Roach, John. (2005) "2,000-Year-Old Seed Sprouts, Sapling Is Thriving Archived 2007-02-03 at the Wayback Machine", National Geographic News, 22 November. ^ "Ice Age flower revival that could lead to resurrection of mammoth". Telegraph.co.uk. 21 February 2012. Archived from the original on 22 March 2014. ^ "Russian Scientists Revive 32,000-Year-Old Flower". sci-news.com. Archived from the original on 2012-02-27. ^ Corner EJH (1966). The Natural History of Palms. Berkeley, CA: University of California Press. pp. 313–314. ^ Taylor EL; Taylor TMC (1993). The biology and evolution of fossil plants. Englewood Cliffs, NJ: Prentice Hall. p. 466. ISBN 978-0-13-651589-0. ^ King James Version, Genesis 1:12,13, 1611. Bewley, J.Derek; Black, Michael; Halmer, Peter, eds. (2006). The encyclopedia of seeds : science, technology and uses. Wallingford: CABI. ISBN 978-0-85199-723-0. Retrieved 15 December 2015. The Seed Site: collecting, storing, sowing, germinating, and exchanging seeds, with pictures of seeds, seedpods and seedlings.